Your trees may be long overdue for tree trimming in Bergen County, NJ, and you may not even know it! Amazing Tree Services is a full service tree trimming company in NJ that has a proven record of customer satisfaction. From our affordable prices to our dedicated tree trimming crew that works through rain and shine, we guarantee you and your branches will not be left hanging. Our reliable tree trimming experts in NJ will safely and efficiently remove unwanted tree branches without any mess left behind. If you have trees that have large, dangerous branches, dead or diseased branches, or if your trees are overgrown, our service for tree trimming in Bergen County, NJ is the service for you. Our professionals trim away future expenses because of damage from a fallen branch, while allowing our customers to live with ease. Our branch removal gives your backyard the amount of light you desire and your grass the amount of light it needs. We will ensure that the tree itself is left undamaged while making sure other branches will not detach or cause destruction. Surrounding trees will not be harmed in the tree trimming process. Do not put up with unwanted, overgrown or even hazardous tree branches. Amazing Tree Services that takes on jobs both big and small when it comes to tree trimming in Bergen County, NJ. We give our customers the peace of mind and property they deserve to have through affordable and efficient services. For more information about our services for tree trimming in Bergen County, NJ, contact Amazing Tree Services at 973-343-6868 for further questions. If tree stumps left on your property are causing your soil and yard problems, Amazing Tree Services offers stump grinding in NJ to remove the tree stumps quickly and efficiently. Amazing Tree Services is a fully guaranteed and insured tree company in NJ that can handle any stump you want to have removed. 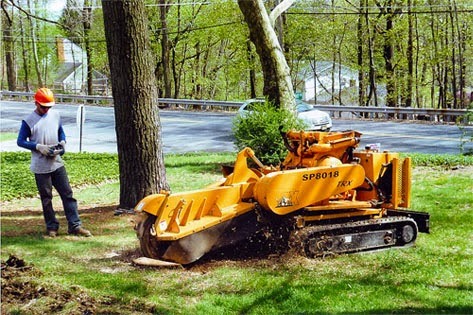 Our stump grinding professionals in Bergen County, NJ are dedicated to providing customers with an affordable and efficient stump grinding experience. With our own trucks, cranes, tools and supplies, our professionals will remove any stump causing you problems through our services for stump grinding in NJ. This will save you from future expenses because of property damage or medical expenses from tripping and falling. Eliminate complications from your leftover tree stump and trust the stump grinding experts to safely remove your tree stump for a beautiful, smooth yard. We promise you the peace of mind to walk around your yard without any fear of falling because of a sinkhole once we complete our services for stump grinding in NJ. Through rain and shine, our stump grinding experts will work hard to ensure you a safe and beautiful yard. For more information on about our services for stump grinding in NJ, speak to one of our tree experts at Amazing Tree Services at 973-343-6868 today! Amazing Tree Services provides top-notch tree removal service in NJ. Having served Bergen, Passaic, Morris and Essex Counties, our experienced tree removal team is knowledgeable in minimizing any possible risks or complications while maximizing productivity and efficiency in your tree service needs. Our fully-insured company is skilled and trained in many tree services, including tree removal in NJ. If you suspect that a tree on your property may be dying or needs to be removed, do not hesitate to call Amazing Tree Services for tree removal service in NJ. Regardless of how large any fallen or living tree is, we are fully qualified and insured to handle the tree removal quickly and efficiently. To ensure the safety of the structure of your home, surrounding buildings and, most importantly, pedestrians, please have Amazing Tree Services evaluate large, older trees that may endanger their surroundings. As a leading tree company in NJ, we ensure that your property will be left clean and without any debris after we complete our tree removal service in NJ. In addition, our crew will provide you with the option to have your removed tree cut into firewood. All professional tree removal estimates are free of charge and there is an additional 10% discount for all first-time customers, veterans and senior citizens. Contact Amazing Tree Services today, and our tree professionals will be available to answer any questions about our services. For more information about our tree removal service in NJ, call 973-343-6868 today! 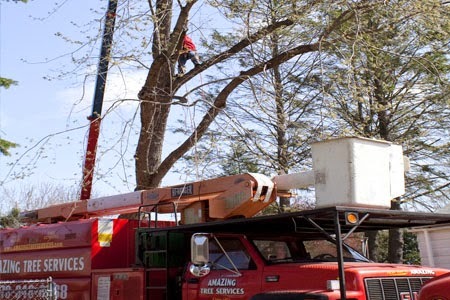 Amazing Tree Services provides top-notch crane service in Morristown, NJ. Having served Bergen, Passaic, Morris and Essex Counties, our experienced team is knowledgeable in minimizing any possible risks or complications while maximizing efficiency and quality in your crane service needs. Our fully insured crew is qualified and trained in crane service in Morristown, NJ. Our company offers both residential crane service and commercial crane service in Morristown, NJ. Whether your crane project is big or small, Amazing Tree Services can take on the job. In addition, our expert crane technicians are available for emergencies. Utilizing our crane service is the safest way to remove any large, dangerous tree branches that could potentially cause damage to your property. As a leading crane company in NJ, we ensure that your property will be left clean and beautiful. All estimates for our professional crane service in Morristown, NJ are free of charge, and there is an additional 10% discount for all first time customers, veterans and senior citizens. Contact Amazing Tree Services today and our tree professionals will be available to answer any questions about our services. For more information on our crane service in Morristown, NJ, call 973-343-6868 today! Tree pruning in NJ is just the thing your property may need to make it look healthy and fresh once again. Amazing Tree Services is a tree service company in NJ that provides tree pruning services. Our tree company has been serving Bergen, Passaic, Morris and Essex Counties for many years, and our experienced team is knowledgeable in minimizing any possible risks or complications while maximizing productivity and efficiency in your NJ tree pruning needs. Amazing Tree Services exclusively employs expert tree technicians and our fully-insured company is skilled and trained in tree pruning throughout NJ. Our company’s cosmetic tree pruning in NJ will remove dead or diseased tree limbs to ensure that the tree is healthy and looking beautiful. Tree pruning also involves decreasing the size of the canopy, which will increase the amount of light that hits your lawn, thus improving the health of your grass. Amazing Tree Services’ fully-insured crew of expert tree pruning technicians are experienced in inspecting branches deep within the tree’s canopy. As a leading tree company, we ensure that your property will be left clean and without any debris when we perform our services for tree pruning in NJ. All professional tree pruning estimates are free of charge and there is an additional 10% discount for all first time customers, veterans and senior citizens. For more information about our services for tree pruning in NJ or to receive a free estimate, call Amazing Tree Services at 973-343-6868 today! If you are searching for a way to keep costs low when you need to remove a tree from your property, Amazing Tree Services is now offering tree removal coupons in NJ! Amazing Tree Services is a tree company in NJ filled with experts who aim to remove your trees in an affordable and easy process. Our fully-insured tree company specializes in tree removal in Passaic County, tree removal in Morris County and tree removal in Essex County. On top of our affordable tree service prices, we provide tree removal discounts and tree removal coupons for our customers. Money does not grow on trees and should not be thrown away with your tree when you require removal services. Our tree removal professionals at Amazing Tree Services are trained to provide our customers with quality tree removal services. We refrain from subcontracting our tree removal service to outside contractors. Instead, we hire a skilled team of tree removal experts to provide our customers with quick and efficient services. Because we do all of the work ourselves, we are able to provide our customers with discounts, offers and tree removal coupons in NJ. Using our tree removal coupons in NJ with our tree removal services can help you save for other expenses you may have. You do not have to feel stuck with a tree on your property that puts your home or car in danger. Our tree experts will make the tree removal process as easy and safe as possible. We promise to protect your property while improving its appearance and safety. We can even cut down your tree into firewood at your request. At Amazing Tree Services, our tree removal prices cannot be beat. Prior customers have been satisfied with the prices our tree removal professionals charge and impressed with the dedication we put into our work. We will provide you with a free tree removal estimate that will allow you to decide for yourself. For more information about our tree removal coupons in NJ, contact us at 973-343-6868 today to take advantage of our tree removal discounts before they expire. 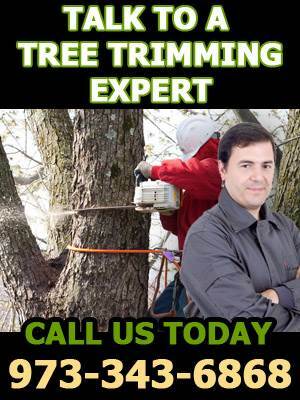 Are you looking for tree trimming in Passaic County NJ? Amazing Tree Services is a full service tree company in NJ that provides insured tree services throughout Passaic County. We are dedicated to providing our customers with quality tree services in NJ that are both efficient and affordable. When it comes to tree trimming, our professional tree technicians have the knowledge and expertise to efficiently trim your trees. There are many reasons why Passaic County NJ tree trimming may be needed. Any broken branches that can possibly fall and cause damage to property should be trimmed. With the number of storms that have hit the east coast in the last couple of weeks, there may be many broken or weak branches hanging off your trees. Trimming a tree also benefits the overall health of the tree. This action can improve the way your home or commercial building looks, which also improves aesthetic qualities. Amazing Tree Services’ tree trimming in Passaic County NJ will bring these benefits to you with our tree trimming service. Our professional tree technicians in NJ will assess other branches to ensure that the trees on your property are healthy and safe. This NJ tree company owns all of the equipment and machinery necessary to safely remove a large branch without causing damage to the tree itself, as well as surrounding trees. This means that we can quickly arrive on-site because we do not need to wait on anyone else to bring the equipment. For more information on Passaic County NJ tree trimming, call Amazing Tree Services today at 973-343-6868. Are you looking for tree removal in NJ? Amazing Tree Services is a full service NJ tree company that provides insured tree services throughout New Jersey. Our tree technicians are dedicated to providing our customers with quality tree services in NJ that are both efficient and affordable. We have the complex machinery and the experience to remove any tree, even if it is still in the ground. The amount of storms hitting the east coast these past few weeks has knocked down a number of trees and weakened the bases of many others. Those fallen trees need to be taken off the property as soon as possible and the weakened trees must be removed before they fall and cause damage. NJ tree removal by Amazing Tree Service will keep your property clean and safe. Our fully insured crew is knowledgeable and skilled in tree removal in NJ. We also own all of our own equipment and take all means necessary to minimize risk or complications while maximizing productivity and efficiency in all of our tree services. Once we are finished removing your unwanted tree, we will leave your property impeccably clean and without any debris left behind. Our crew of tree experts will also offer to cut your tree into firewood if you would like. For more information on NJ tree removal, call Amazing Tree Service today at (973) 343-6868.